Photo: ERIK S. LESSER/? Corbis. All Rights Reserved. It turns out that Donald Trump was right — Rick Perry just dropped out of the 2016 presidential race. “We have a tremendous field — the best in a generation — so I step aside knowing our party is in good hands, and as long as we listen to the grassroots, the cause of conservatism will be too,” the former Texas governor said immediately after announcing that he was suspending his campaign during a speech at a conservative event in St. Louis, Missouri. This outcome seemed inevitable — in a primary with nearly 20 candidates, Perry was only at around 1 percent in the polls. He stopped paying staffers in early August after he ran out of money. Perry is the first Republican candidate to drop out of the race. 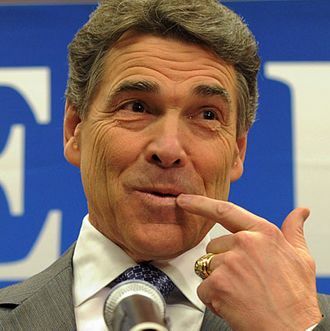 In 2012, Rick Perry ended his presidential bid in mid-January, shortly before the South Carolina primary and a few months after his infamous “oops” debate moment. This time around Perry didn’t poll high enough to get into the first GOP debate; the closest he got to an “oops” moment was maybe saying “Ronald Raven” at a forum for lesser-loved candidates. During a press conference last week, Trump — the first Republican candidate to break 30 percent in the polls — said that Perry was about to drop out of the race. When Perry was asked about Trump’s remarks on Fox News, he replied, “You know a broken clock is right once a day” — which apparently was closer to the truth than Perry meant.
.@GovernorPerry has dedicated his entire life to his family, friends, and Jesus Christ.
.@GovernorPerry, I'm proud to call you my friend and I wish you the best in the future. … Even if it meant sort of admitting that he might have deserved to stay in the presidential race longer than you.